Updated version of Z originally released for mobile devices. Language settings are stored in <path-to-game>\language on Windows. Video settings are stored in <path-to-game>\display on Windows. Each save is a numbered pair of savedata-* and saveinfo-* files. Unusable (gameplay is zoomed in too far). Added in Update 2. Toggle in settings. Frame rate is capped at 17 FPS. Windowed mode is unusable at some low desktop resolutions such as 1024x768 (see Stuck in unusable windowed mode). Windowed mode is unusable at some low desktop resolutions such as 1024x768. Delete display. 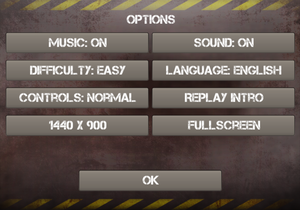 Fullscreen mode will now be used. ↑ 2.0 2.1 File/folder structure within this directory reflects the path(s) listed for Windows and/or Steam game data (use Wine regedit to access Windows registry paths). Games with Steam Cloud support may store data in ~/.steam/steam/userdata/<user-id>/275530/ in addition to or instead of this directory. The app ID (275530) may differ in some cases. Treat backslashes as forward slashes. See the glossary page for details.